Can anyone help. After finding two of the wrenches I had to come out of the game, which I saved. When I went back in they seem to be missing and I have moved on to far and flooded the machine room so can't get the water to turn of, hope this makes sense. There's already a thread about the wrench problem (assuming that you're playing on an iPAD). It's called: "(iPAD) 3 wrench bug?" BTW, don't forget to upgrade to Version 1.1 of the game. Hi, I am on an iPAD2 and I already had version 1.1 installed and still had the wrench bug. 2 of them dissappeared and I can't turn the water off now. This '3 wrench' issue keeps stumping some iPAD players over and over again. And yet there are other players that never had this bug affect them and they've gone on to finish the game. I wonder what the common cause of the disappearing wrenches could be. If you, sonrisa - or anyone else following this thread - could contribute your input, it could be helpful to the devs when they release the next iPAD version. It looks to me that the players who find a couple of the wrenches and then - for whatever reason - decide to climb the ladder OUT of the scene with the pool to look around, and then climb back down then have wrenches missing from their inventory. I don't remember exactly step by step what I did. I did get the 3 wrenches and placed them at different positions and did go up the ladder to see, if the water was turned off. Came back down, looked at the the big book again, replaced the wrenches (wrong again by the way) and took that "animal" to remove the thing at the bottom as soon as the water started gushing out 2 of the wrenches disappeared.... So yes, for sure I went up the ladder inbetween, I remeber that. I guess, I start over and do everything right - or I'll try. Awesome game by the way. I am thrilled. Wuh? Wait a minute. If you used the "animal" to remove the cap at the bottom of the reservoir and now the pool is full of water... what do you need the wrenches for any longer? Get on with the game! And, in case you haven't figured it out already, here's a spoiler to show you the next step. 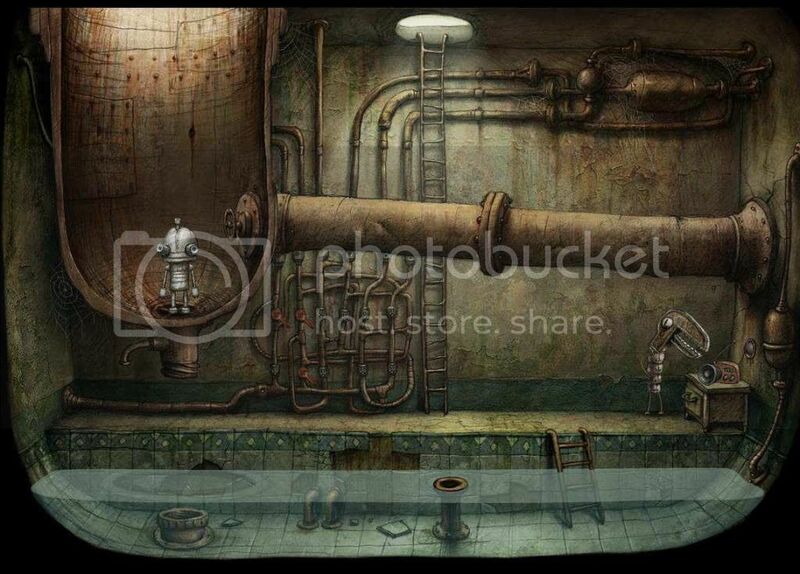 Yes, the water filled the room, and the wrenches had disappeared BEVORE I placed them correctly to stop the water. So: I got the wrenches, placed them incorrectly, went upstairs to check, the water was still on. went back downstairs, placed them (wrong) again and then removed the big thing, so the water would fill the room. Right there 2 wrenches disappeared from the pipes, and I was never able to place them correctly to stop the water and so it just kept gushing. Either way, I went back a few levels, did it again, placed them correctly right away and finished the game. Thanks.